A New Breed of Track! 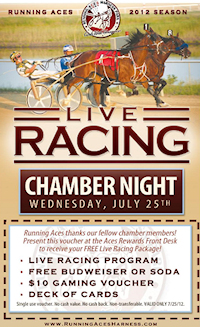 Running Aces is a five eights mile harness track in Columbus, located about thirty minutes north of Minneapolis. A newcomer to the scene having been built in 2008 Running Aces doesn't seem very horse friendly. They do feature a short harness meet in the summer, but the focus seems to be on gaming. There is no grandstand and seating is a couple of benches on the apron. Running Aces features a twenty four seven card room and there is year round simulcasting. Running Aces also has the Winners Circle restaurant, which does give you a view of live racing. Built on a small footprint as a Racino(poker only) and running a limited Harness meet Running Aces might well be the prototype of the future of racing. Running Aces is also the newest harness track in the United States and became the nations newest facility when Pinnacle Race Course near Detroit went out of business. If you plan to visit Running Aces get some good directions, it seems Columbus, Minnesota is pretty hard to find on a map. In 2011 running live racing from May to August. Dean Magee trotted away with the driving title. Racing resumes in 2012. I did make a visit to Running Aces, unfortunately it wasn't during racing season. I knew it was listed as a racino so I figured I could kill a little time playing the slots. It was a Sunday morning and I would be the only one there, but the parking lot was pretty full. I sensed something wasn't quite right when I walked in and I didn't hear the constant ding, ding, ding your supposed to hear in a casino. Well there was no casino, just a card room. Hell there was no race track, just a card room. It seems they never got around to building a grandstand. Poker has done well for Running Aces, but it might not be enough. The big prized was really slot machines, but that probably not going to happen. For years Running Aces has been teaming up with it's big cousin Canterbury Park, to lobby the State to legalize slots but in 2014 Canterbury went off on it's own and signed a treaty with a local Indian Tribe, where the Indian Casino will supplement purses at Canterbury in exchange for them giving up the idea of a casino at the track. This now leaves Running Aces on their own.